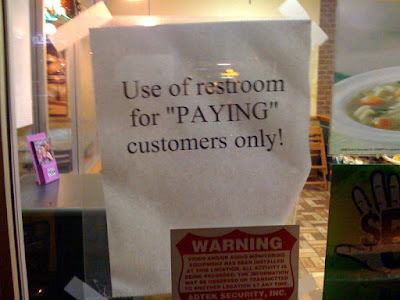 The “Blog” of “Unnecessary” Quotation Marks: "paying" in a variety of ways? Christopher saw this at a Subway in Spokane, WA. I guess if you say you are "paying" that is good enough. It's how you pay for this privilege that is the issue most customers have. Which begs the question, what do they do about their "non-paying" customers? Yeah! What if I go into Subway, examine the menu, have a sudden urge to pee, use their facilities, then decide I don't want a sub after all, and leave? WHAT WILL THEY DO THEN? As Buffy so astutely point out, this seems to be tacit approval of shoplifting. Non-paying customers pee on the floor, obviously! Oh dear, I'm thinking of a bow-chicka-bow-wow kind of payment. WV: hograce -- I'm not betting on the slow-witted swine who made this sign. So the only thing the restrooms are can be used for is "Paying" customers? Why they would pay the customers and why it would necessitate the use of a restroom to do so, I'd rather not be paid. I'm sure that some of the "payment" itself is going on in the restroom there.. guffaw guffaw.. This is an appropriate use. The children of the actually paying guest didn't pay, so they are "paying" guests. Quit stretching, there are enough bad ones out there.